During the week, your child's music teachers are the greatest composers that ever lived! Children’s Music Journey is a beautifully animated, music learning tool that incorporates rigorous pedagogy and ensures kids have fun practicing by taking part in engaging lessons, activities and games. During the week, your child's music teachers are the greatest composers that ever lived! Children's Music Journey is a beautifully animated, music learning tool that incorporates rigorous pedagogy and ensures kids have fun practicing by taking part in engaging lessons, activities and games. Save $35! 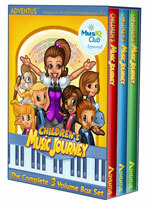 Order the Children's Music Journey 3-Volume Box Set and we'll ship you Volume 3 and the Collector's box asap! Developed by experienced music educators and leaders in piano pedagogy Piano Suite is the most sophisticated piano learning program available today. With an advanced learning engine, careful methodology and a massive library of learning repertoire, students can make excellent progress in music theory, playing skills, composition and music history during practice. Piano Player: interative piano practice with valuable audio/visual feedback. The learn-to-play engine allows the user to select 9 different methods for playing and evaluation. Library: the sheet music library includes over 500 pieces to play, practice and enjoy from Pop/Rock to Classical, from Folk to Jazz/Blues. Each selection is beautifully illustrated with animation, lyrics and voice recordings to bring the music to life. It's even possible to download songs from the internet to learn. Theory Thinker: hundreds of narrated, step by step theory lessons with practice exercises to teach notation, sight-reading, and playing skills. Composers Corner: Compose, edit, and print your own music and then be evaluated on how well you play it. Pieces can be saved to a custom library. Games: challenging and fun music related activities to reinforce lessons, sharpen your piano playing skills and develop theory comprehension. Personal Profile: individual performance records let you or your instructor review your progress, tracking the results of every piece practiced or game played, for dozens of users. History Happens: detailed biographies of over 150 famous composers and performers who have helped shape the history of music. Turn your computer (Mac or PC) into a music learning station. This 49-key, synth-action USB MIDI piano keyboard makes playing and learning music on your computer simple. It includes professional features like pitch and mod wheels, an assignable volume slider, octave +/- buttons and sustain pedal input. Plus, it’s powered via a single USB cable! Turn your computer (Mac or PC) into a music learning station. If you appreciate the full range of a piano keyboard in a lightweight package, the 88-note Keystation 88es is for you. You get great-feeling, semi-weighted action that is velocity sensitive to convey all the nuances of your playing to your computer. The pitch and modulation wheels plus slider and buttons make it a great controller for playing and programming synths, samplers, drum sounds and more. At just 22 lbs., the Keystation 88es is easy to handle. It is even bus-powered, so one simple USB cable is the only connection you need. Class compliancy with Windows XP and Mac OS X. About Practice Piano practice at home is important for all students. The difference in skill development between students who practice and students who don't is significant. Unlike the traditional practice experience, the award-winning MusIQ Club software directs and provides feedback, making piano practice efficient and enjoyable for both students and parents. Ideally, students practice 15-20 min, 4-5 days per week to master concepts, learn new pieces, beat theory games, and prepare for performances. New This Year! Practice Software included with each Registration Your MusIQ Club registration includes 3-month access to award-winning interactive Adventus software for fun and effective practice at home. Unlimited, full-feature access to all MusIQ Club software ($450 value). Best value - available to MusIQ Club members only. Download instructions sent via email. To use the software for practice at home, a MIDI keyboard is required (a piano keyboard that connects to your computer). If you have a digital keyboard, check the back for a MIDI OUT or USB connection. 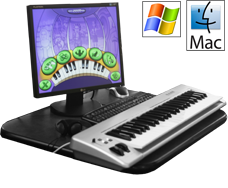 If you don't have access to a keyboard, the Acorn Masterkey 49 used in MusIQ Club classes is available to members for $125.00 plus $14.95 shipping.